LiDAR Market size was USD 365.5 million in 2015. The latest analysis forecasts revenue to exceed USD 1.1 billion by 2023. Surging applicability in 3D scanning market and imaging maneuvers is estimated to propel growth. Major technological developments include emergence of optically extended MEMS scanning mirror for low-altitude and light weight flying platforms. Long term reliability of number of key laser components such as optical coatings, optics, and diodes in vacuum and radiation environment of space is expected to drive (Light Detection & Ranging) LiDAR market. Environment Canada monitoring stations utilize this technology to monitor the tropospheric pollution. Advancements in data storage capabilities and computer processing speed have lowered the cost and increased the efficiencies of working with data. Compatible mobile systems with large storage capacity have already found imaging applications. Various underground applications for these systems include tunnel deformation, scaling measurement, identification/measurement of structure, as-built tunnel or cavern geometry and rockfall source detection. Lack of customer risk awareness and education regarding identity protection are major challenges for adoption. The government sector will lead global revenue with over USD 340 million expectations by 2023. Corridor mapping applications are forecast to grow with 21.5% CAGR over the forecast timeframe. Civil engineering is also expected to be a fast-growing sector. LiDAR surveys in civil engineering produce accurate elevation data for roads and construction projects. Growing 3D imagery demand as well as considerable applicability in government and commercial sectors including roadways & railway management and forestry is anticipated to prove favorable for industry growth. 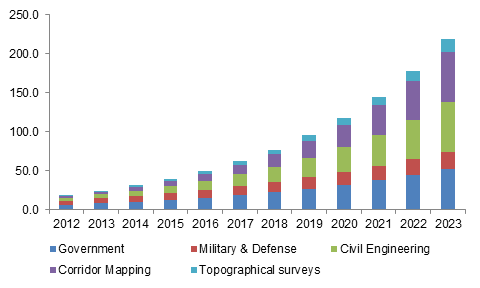 Mobile LiDAR market is set to grow at 22% CAGR from 2016 to 2023. Increased penetration across wind projects, transporatation agencies, urban data acquisiton are forecast to aid growth. Multi viewpoint data collection, greater degree of efficiency, and increasing number of projects on a global scale will positively impact revenue across various industry applications. Airborne will exceed USD 400 million by 2023. Full waveform analysis and multi target capability have already been available for aerial mapping, however, implementation in ground mapping technology will present a key opportunity for short range and mobile mapping systems. Laser scanners are the largest and most attractive market segment. The industry is poised to surpass USD 540 million, with over 17% CAGR from 2016 to 2023. A typical system also contains inertial measurement unit (IMU), data storage & management systems, GPS, MEMS mirror and cameras. High resolution digital cameras are used in combination with the technology, and their inputs are combined to obtain more comprehensive results in case of complex terrain mapping applications. Component manufacturers are connected to the gatherers that provide services such as data collection and processing. U.S. was more than USD 85 million in 2015 and is forecast to grow at 9.3% CAGR over the forecast timeframe. Advancements in inertial navigation unit and GPS will drive Europe LiDAR market. Civil engineering and corridor mapping applications are expected to witness substantial growth owing to enormous demand for security at commercial places, such as hotels, airports, offices and hospitals. Asia Pacific revenue is forecast to exceed USD 470 million by 2023. This may be primarily attributed to increasing low-cost manufacturing activities in the region. Growing product launches coupled with high consumer adoption in the region is forecast to result in increased investment from stakeholders and fuel demand. Global LiDAR industry players include Faro Technologies, Renishaw, Saab, Intermap Technologies, Leica Geosystems, Riegl, Trimble Navigation, Aerometric, 3D Laser Mapping, etc. Mergers and acquisitions are being adopted by key players to extend their presence across the globe. For instance, In July 2014, Saab acquired ThyssenKrupp Marine Systems AB. Manufacturers emphasize on expanding their distribution activities globally through a network of independent distributors. Companies support sales and customer relations efforts by offering operator training, raw material handling, automated testing equipment and service training. Competitive pricing and maintaining profit margins remains the key concern for industry participants.